Last weekend we decided to have a few of our friends over for appetizers and drinks to celebrate fall flavors and as a last little get together before the baby arrives…. Because who knows when we will be able to have people over again. The menu I had planned included Skinny Pumpkin Dip with apples, Baked Brie with Pecans and Pears, a few other cheeses and grapes with gluten free crackers, butternut squash crostini (recipe coming soon) and sparkling cranberry apple cider. 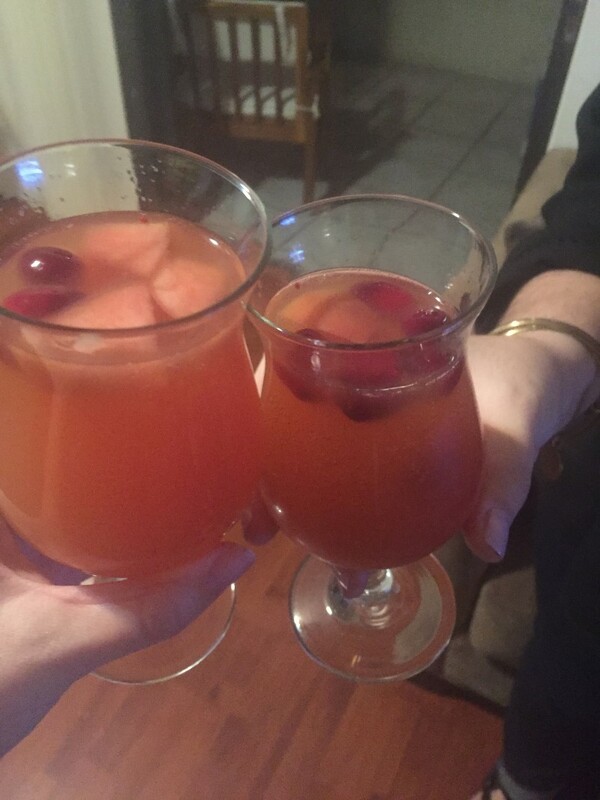 I wanted to make a nonalcoholic drink that I could enjoy but of course also have the option of adding alcohol for everyone else…. So I decided to make an apple cider as a sort of “mixer” so everyone could add whatever alcohol they preferred to it. I also wanted to infuse a lot of fall flavors such as cinnamon and cranberries so I decided to cook some fruit with spices first then add it to the apple cider so the flavors could meld overnight. 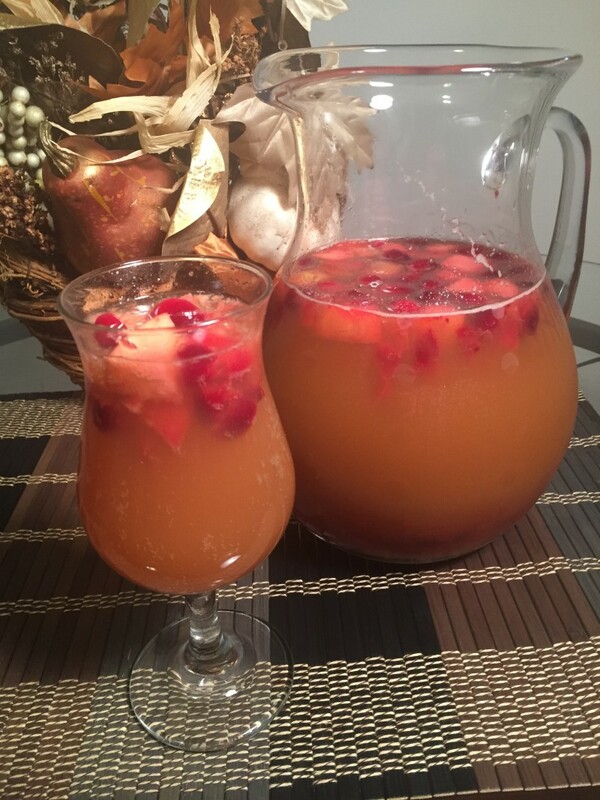 I didn’t want a warm apple cider because I live in south florida and it is not quite cool enough for that yet, but you can easily adapt the recipe to make it warm if that is what you prefer. Anyways, I topped my apple cider with soda water as I love a sparkling mocktail, and for the most part everyone else added a little bit of vodka and sparkling wine to their glasses, and seemed to enjoy it that way. Add cranberries, zest from orange, pieces of orange, Apple and pear along with cinnamon sticks, honey, all spice, and water to a medium saucepan. Mix together and bring to a boil. Turn down heat and simmer for about 10 min or until cranberries break open and flavors meld. Turn off stove top and allow to cool. Once cool, add to apple cider in a punch bowl or large pitcher and put in the refrigerator overnight. When ready to serve, fill glass halfway with cider and then top with soda water or sparkling wine. If you like your drinks strong, add a little vodka or liquor of preference. Cheers! Baked Brie is such an easy and delicious classic holiday appetizer, but the way you prepare it can really make a difference for your waistline and overall health. I know a lot of people like to prepare it by topping it with jelly and wrapping it in puff pastry, however this adds quite a few calories and refined carbohydrates, which is not great for someone that is trying to at least eat semi-healthy over the holidays. I like to prepare my brie with real ingredients like nuts and fruit so at least the extra calories I will be adding to the brie will come with nutrients such as vitamins, fiber and “good for you” fatty acids. Plus, I think my brie tastes better, but I may be a little biased. Preheat oven to 350 degrees. Spray small sauté pan with cooking spray. Sauté pears and pecans in pan with cinnamon and maple syrup on medium heat, stirring continually for about 5 min, or until pears and pecans are warm and fragrant. Place Brie in a Brie baking dish (I love mine from Crate and Barrel: http://www.crateandbarrel.com/brie-baking-dish/s672630), top with pear and pecan topping and cover with lid. Cook in oven for ~10-15 minutes. For comparison, 1 serving of baked brie cooked with a Pepperidge Farm Puff Pastry Sheet has 232 calories and 9 grams of saturated fat per serving. Sweet potatoes are a great fall favorite. Delicious and full of Vitamin A they can be used in many different ways. Vitamin A is a fat soluble vitamin, meaning it is stored in fat in your body. Adding a little good fat (not too much, or you can end up adding a lot of extra calories) such as olive oil to your sweet potatoes will help your body to better absorb the Vitamin A. Sweet potatoes also have a lot of potassium which can be helpful with controlling blood pressure. 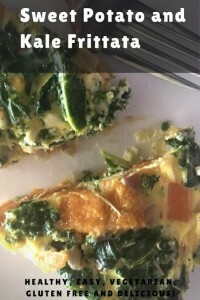 I have been wanting to try and make a frittata since this summer when I first attempted to make one. It was a zucchini and yellow squash frittata that got overcooked and I ended up having to scrape off the bottom layer because it was all burnt. Apparently it was still decent though because my husband managed to eat it…. Although he may have just eaten it so I wouldn’t feel bad that I ruined dinner. This time I wanted to try using fall flavors so I got sweet potatoes, a bunch of kale, onions and goat cheese to give it a more hearty autumn feel. I was more careful with the cooking time and it turned out perfectly cooked. Preheat oven to 400 degrees. Mix eggs, milk and cheese together in a medium mixing bowl. Stir in rosemary and salt, set aside. Add olive oil to an 8 inch skillet on medium heat. Add garlic and onions and sauté until almost translucent. Turn down to med low. Add kale and stir to ensure kale cooks down evenly. 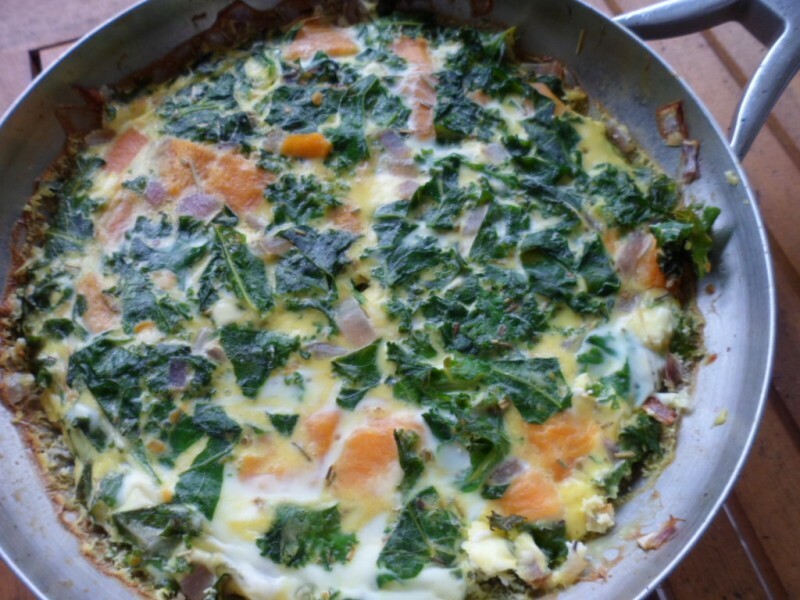 After kale shrinks and becomes wilted, add in sweet potatoes and distribute evenly. Pour egg mixture into pan with veggies and stir until uniform. 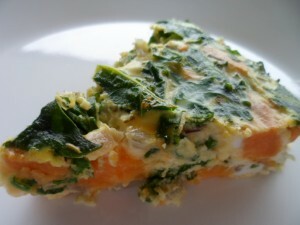 Remove pan from heat and bake in oven on 400 degrees for 20 min or until edges appear slightly browned and frittata is firm.